5 April 2017, at 6:00a.m. UK - The UK farming sector must put forward a strong case for continued support from public funds once the UK leaves the EU or it might lose out. Now that Article 50 has been invoked and negotiations are starting over the terms of the UK’s exit from the EU, a seminar in London heard that the food and farming sector will need to justify its existence to be able to continue to receive financial support. MP Neil Parish, chair of the Environment Food and Rural Affairs Select Committee, who was chairing one of the debates at the Westminster Food and Nutrition Forum’s seminar on the Future of UK Agriculture Policy, warned that the sector will need to show that whatever support it receives will be going to some public good. “It’s going to be a rear-guard action as far as the treasury is concerned,” he said. Patrick Begg, the Rural Enterprises Director of the National Trust stressed that UK farming is dependent on support from the CAP for its income with the pig and poultry sectors being among a small number that are making a profit. He stressed the “co-dependency of farming and the natural environment” in keeping public investment in the countryside. Gary Mitchell, the vice president of the National Farmers Union of Scotland said that farm businesses in Scotland had seen an average income of £23,000 in 2013/2014. However, if support payments were excluded that income would turn to a loss of £17,000. Mr Mitchell added that future support depends on the deal that the government achieves in its negotiations, particularly the trading arrangements with the EU and trading arrangements with the rest of the world as well as access to labour. He called for support systems to drive collaboration between farmers and with the supply chain, drive innovation and support productivity. At present the British government had guaranteed support that currently comes through the Common Agricultural Policy until 2020. Mike Rowe, the deputy director for future agriculture policy at Defra said that the UK agriculture sector made a significant contribution to the economy, offering £9 billion in income and employing 480,000 people. However, he said that the UK received £2.8 billion in direct payments through the CAP, with 20 per cent through Pillar II payments. He said that the payments through the CAP for agriculture have an impact on the wildlife, water, soil, environment and the landscape and but they are also seen to have a social and cultural impact. Mr Rowe said that the transition from the Common Agricultural Policy to a domestic agricultural policy will depend of trade, the UK’s future relationship with the EU, the devolution of powers to the four regions of the UK funding and legislation. He added that a future support programme will have to improve the environment and produce a productive food and farming industry with improved animal health and welfare. At the same time, new support measures will also have to take into account risk management and volatility, food safety and consumer confidence. Mr Rowe said the government is seeking ambitious free trade agreements and it is already in discussions with the World Trade Organisation over the UK’s position in world trade. He added that the government is seeking an orderly transition. “It is critical we work through all the areas to ensure farmers and land managers understand what they have to do,” he said. The government is now planning a series of regional events and workshops to clarify the options to farmers over future support measures. John Elliott, the head of Economic Policy and Evaluation and ADAS, said that future support could either be achieved through evolution – by phasing out Pillar I direct payments and developing the indirect payments in Pillar II, stimulating support for innovation and developing a policy for risk management – or by starting again with no direct payments seeing that any public money going to farmers is seen to be for the public good as well as stimulating innovation and adopting risk insurance. Dr Nerys Llewelyn Jones, head of Agri Advisor Solicitors, called for a long-term succession plan for support measures covering 25 to 30 years rather that the potential lifetime of a parliament. She called for different objectives for different parts of the UK and a reduction in bureaucratic red tape. Mark Suthern, the National Head of Agriculture and Barclays Bank said that the future of farming in the UK needed competitive and supportive supply chains with more focus on the use and development of technology to make farming in the UK more sustainable and more competitive. National Farmers Union vice president Guy Smith said it is imperative that there is a “frictionless” trade with the EU and the issues of migrant labour had to be addressed to ensure farms could continue to operate. He called for soft loans for farmers and assurances that support payments are made to the farmer rather than third party landlords and agents. He called for a phasing in of new policies. “In the 1970s it took us six years to go from a domestic agricultural policy to CAP, perhaps it need six years to go the other way,” he said. 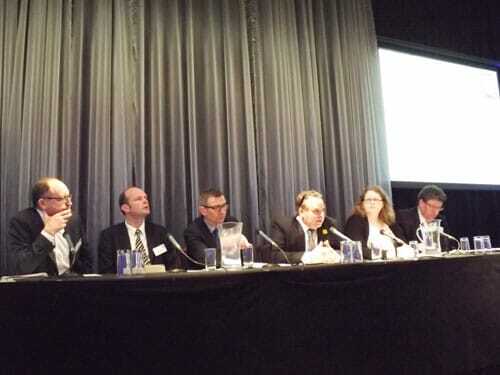 Panel (L-R) John Elliott, ADAS, Patrick Begg, National Trust, Mark Suthern, Barclays, Neil Parish MP, Nerys Llewelyn Jones Agri Advisor Solicitors, Christopher Price Country Land and Business Association.